Update: Gillibrand just signed on to Sanders's "Medicare for all" bill. So now 5 of my top 8 potential 2020 Democratic nominees have now come out for the bill -- before it is even introduced. "Health care should be a right, not a privilege, so I will be joining Senator Bernie Sanders as a cosponsor on his Medicare-for-All legislation," Gillibrand said. Sen. Cory Booker (D-N.J.) became the fourth co-sponsor of Sen. Bernie Sanders's (I-Vt.) “Medicare for all” health-care bill Monday. In doing so, he joined Sens. Elizabeth Warren (D-Mass.) and Kamala D. Harris (D-Calif.). What do those four senators have in common? Well, they just happen to constitute four of the eight most likely 2020 Democratic presidential nominees, according to the handy list I put out Friday. And another senator in my top 8, Kirsten Gillibrand (D-N.Y.), last month came out in favor of the idea of “Medicare for all” — though not this specific bill (yet). This is about as far from a coincidence as you can get. And it suggests the dam is breaking when it comes to the Democratic Party embracing government-funded health care, also known as single-payer. It also seems to confirm that these senators have clear designs on running. The last thing any of them want is to see another candidate get to their left on this, so each of them are quick to go on-record — much quicker than their not-eyeing-2020 colleagues who can afford to be more judicious and deliberate. The bill hasn't even been introduced yet; that'll come Wednesday. That's not to say single-payer isn't gaining support elsewhere in the Senate Democratic caucus. Notably, Sen. Jon Tester (D-Mont.) said last week that Congress should take a “solid look” at single-payer. Activists hailed even those cautious words given Tester represents a red state and has previously been dismissive of the idea that single-payer's time has come. Tester said “we are so far away” from that debate in both March and June. Update: Tester's office is downplaying the "solid look" comments, noting that he voted against single-payer when Senate Republicans forced a vote on it in July. All but five members of the Senate Democratic caucus voted "present" in protest of the gambit, but Tester voted "no"along with four others. Tester is hardly the only Democrat to resist this debate. Just last year, Hillary Clinton dismissed single-payer as “a theoretical debate about some better idea that will never, ever come to pass.” Fast-forward a year, and it's leading Democratic presidential hopefuls like Clinton that are spearheading this. And polls certainly suggest its time has come — at least on the left. I argued back in July that the biggest winner of the Obamacare repeal debate was single-payer. And polls have repeatedly shown an increase in support for both single-payer and the idea that government should guarantee health care, even among Republicans. 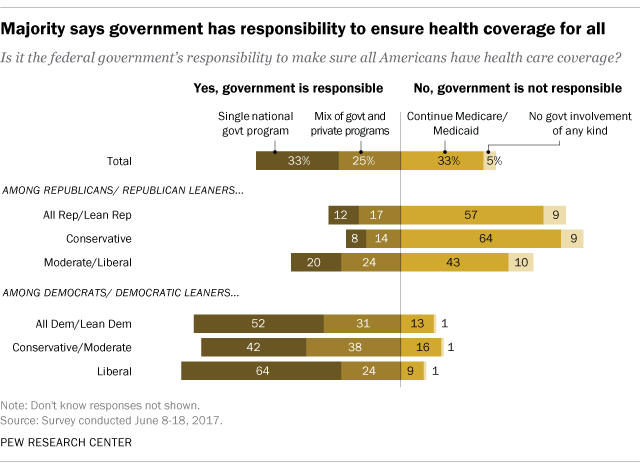 A Pew poll in January showed 60 percent of Americans said the government had a responsibility to provide health-care coverage for all, up from 51 percent the year before. The poll showed just 33 percent overall favored single-payer specifically — versus a “mix of government and private programs” — but among Democrats and Democratic-leaning voters, 52 percent wanted single-payer. And among self-described liberals, it was 64 percent. In other words: The writing is on the wall. The GOP's failed efforts to repeal and/or replace the Affordable Care Act have cemented government's increased role in health care, and not even Republicans are really arguing for a big rollback on that. Meantime, Sanders's stronger-than-expected challenge to Clinton in 2016 showed the power that a base-energizing, single-payer-supporting candidate can have. There are about 18 months, give or take, until the first Democratic debates of 2020, and the trend line is clear enough that Democratic hopefuls know in which direction this will go. They also have the added benefit of knowing they probably won't actually have to vote on this anytime soon. But if a Democrat wins the White House in 2020, it now seems very likely he or she will have promised to pursue single-payer as president. Expect this to continue apace in the days and weeks ahead.